If society is corrupt, but not the individuals within it, then where did the corruption originate? How is it propagated? It’s a one-sided, deeply ideological theory…. Our society faces the increasing call to deconstruct its stabilizing traditions to include smaller and smaller numbers of people who do not or will not fit into categories upon which even our perceptions are based. This is not a good thing…. 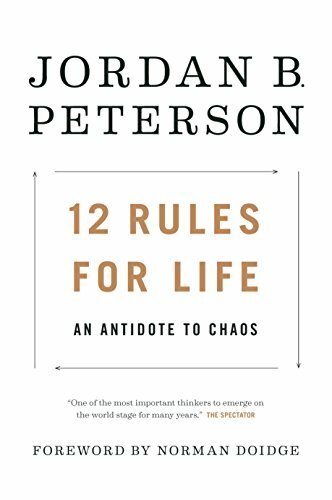 I’m reading Jordan B. Peterson’s bestselling juggernaut, 12 Rules for Life: An Antidote to Chaos. It’s a book remarkable for restating the obvious – which is a revolutionary act in the 21st Century West. I’m not ready to review it yet, but it’s so interesting I thought I’d share a couple thoughts. The book contains elements that make me want to stand up and cheer, and elements that trouble me – particularly in its treatment of Christianity. To be sure, there’s no denigration of Christianity here – in fact, Christian doctrine and morality come in for a lot of praise. But the book is written from a naturalist, Darwinian perspective that would make me furious if the same statements came from, say, the leader of a liberal church. But of course, the source is what makes the difference. I’ve noted before that a man walking toward me may be farther from me than a man walking away from me. But the man walking toward me may reach me in time, while the man walking away will get further and further away. Peterson has, by his own account, gone from Christian faith to atheism in the past. Then he started thinking his way through the great questions, and gradually began to see the simple, practical wisdom of Christianity (and other great religions, to be sure), which he sees as the beneficial fruit of evolutionary processes. I hope and pray that Jordan B. Peterson will come to faith in Jesus Christ in time. But it seems to me that his current agnosticism places him, for the moment, in the ideal place to do an important work. If he were a believer, his book would be cordoned off in the “Christian Literature” section, and nobody would notice it. His skepticism gives him credibility.